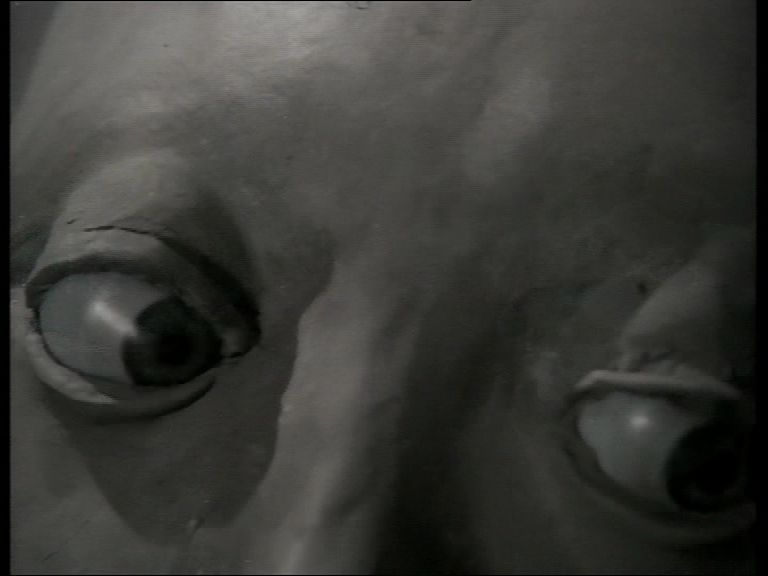 Svankmajer’s shortest film is one of his most disturbing. The most appropriate response might be a similarly concise and abrupt blog post, you may be relieved (and shocked) to know. 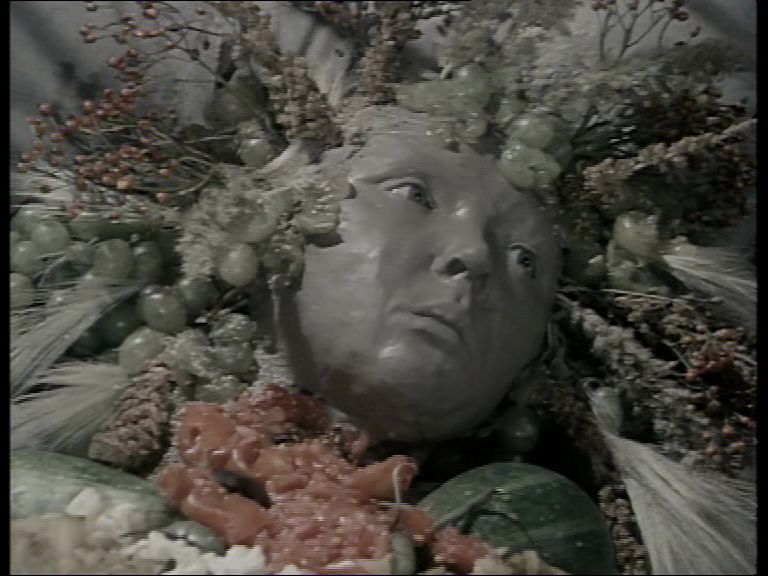 From the opening shot, we are greeted with the site of decomposing vegetables. Cabbage leaves are eaten in circles, tomatoes turn themselves inside out. It is revealed that we are seeing a woman made of vegetables, like an Archimboldo painting, tied hand-and-foot to a bed frame. Pieces of her body are rotting at an accelerated rate. Police sirens can be heard outside amidst a cacophony of scraping, rustling, churning and traffic noise. Maggots begin to squirm, swarm and rave in her gut. In helpless horror, she turns to the bedside table. A single glass of water stands out of reach. It’s all over quickly, 16 shots in 32 seconds, more of a vignette than a story. Most of Svankmajer’s other shorts build up a tight, repetitive structure that builds to a final statement (I refer to examples of these kinds of films in other posts, including The Last Trick, Jabberwocky and Punch and Judy). Flora instead leaves its central image excruciatingly suspended, unresolved. It is in impasse between nourishment and decay – the water Flora needs is inaccessible. We have to suspect she is threatened with death, but the sirens might hint at approaching salvation, if only the situation didn’t look so bleakly urgent. What does is mean? Its elusive, inconclusive effects point towards a strong symbolism, but can we definitively decode it? Ah, the rhetorical questions. Of course we can’t. It’s a fleeting glimpse at an ongoing, perhaps perpetual stalemate, the body continually desirous of but denied what it needs. Beyond that agonising set-up, there’s space for you to parallel park whatever interpretation you want. But more than any other film-maker I can think of, Svankmajer gives prominence to the textures, the haptic eccentricities of the materials he’s using. He brings us uncomfortably close to things from which we would usually recoil. That they are turned into the raw materials of animation is an unsettling transgression of their preferred state of inert, disposable matter. In this case, the medium is food. Food has preoccupied Svankmajer at various points in his career, but in this, Meat Love, Food and the meat puppets of his feature-length Lunacy the stuff twitches into life, putrefies or enacts a servile existence. Food is the stuff of abjection – it enjoys a peculiar relationship with our bodies. We let it in, absorb what we need and turn the rest into excrement and privately expel it, concealing the messy business. It is both necessarily of us and also ickily separate. It can be delicious in its ripe and ready forms, but quickly becomes an embarrassment to our innards deserving of rejection. Here is a deeply personal horror rendered universal by a lack of specificity or restrictive form. Here is a permanent nightmare of sleepless terror, a vision of those moments where you wake up to a reminder of mortality, the most obvious fact in the world that we usually try to absorb and digest without upset. It’s about vegetables, it’s half a minute long, and all human death is here. This entry was posted in Animation, Jan Švankmajer, Stop Motion and tagged Archimboldo, Flora, food, Jan Švankmajer, vegetables by Dan North. Bookmark the permalink.